12nm Vega and Zen products!? At the Globalfoundries Technology Conference (GTC), AMD revealed that they would be transitioning several of their products to the company's new 12nm process, which is set to start shipping products in early 2018. It has been confirmed that AMD will be bringing both their Ryzen CPU and Vega GPU architectures over to this new node, with 12nm now filling the 14nm+ section of AMD's existing Foundry roadmaps. 12nm is based on Globalfoundries' existing 14nm process node, so it makes sense that AMD would call this node 14nm+. It is expected that AMD will be releasing a "tock" like version of Zen on 12nm, though it is likely that this will be more of a "Zen refresh" than a true successor to Zen. AMD is not set to release Zen 2/Zen+ until they make the move to 7nm. AMD is also expected to release Vega 11 GPUs on 12nm, though it is unknown what benefits this new node will provide outside of increased transistor density, increased efficiency and some minor performance boosts. 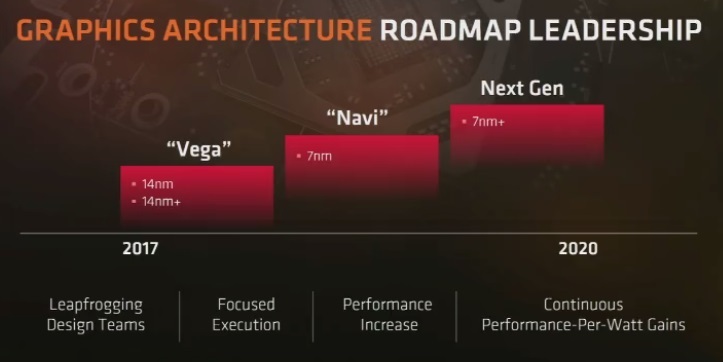 At this time it is hard to tell exactly how much the move to 12nm will help AMD, both in terms of performance and power efficiency. 12nm will certainly not be as revolutionary as 7nm will be, though it will certainly help AMD improve their products in the meantime. This move also showcases AMD's commitment to GlobalFoundries, though rumours still remain that AMD is seeking to move to other fabs to create certain lines of products. You can join the discussion on AMD's planned move to 12nm on the OC3D Forums.